Poet Jessica Ceballos is in love with her hometown, Highland Park, and Downtown Los Angeles, and the East Side and L.A. overall. Born in Highland Park, CA. Ceballos has lived in places as far away as Alaska and Spain. In 2005, she returned to Southern California and discovered a love for her home. Part of her renewed interest is her role as participant, rather than spectator. "I fell in love, again," she said. At each turn, Jessica is curating poetry readings. 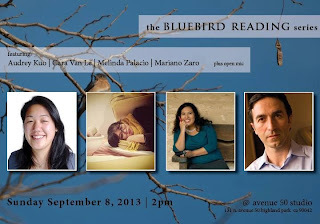 Currently on her role call is the Bluebird Reading Series at Avenue 50 Studios, The Great Beyond at Beyond Baroque, and Poesia Para La Gente, also sponsored by Avenue 50 Studios in Highland Park. Poesia Para La Gente, involves much more than lining up poets, collecting book information, bios, and photos. Last April, Ceballos was more than happy to take over the series, which began in 2011 and has had varied hosts, such as poets Luivette Resto and Abel Salas. This unique reading, while sponsored by Avenue 50, takes poetry readings to a place where walls and a single space for poetry no longer exist. Think laundry mats, taco shops, grocery stores, and train stations. "Why don't we tear the walls down to get people excited about poetry," Ceballos asked herself one day. And the series blossomed. As of this interview, earlier last week, Los Angeles is the last stop for Ceballos. By day, she works in a realtor's office and all the rest of her time, she devotes to her literary community. "I feel I have a responsibility to do more with these readings. I have big plans to expand the literary programming at Avenue 50 Studio into neighboring schools and into geographical areas that have never before experienced poetry. I'm also developing a collaborative poetry project involving several academic disciplines." 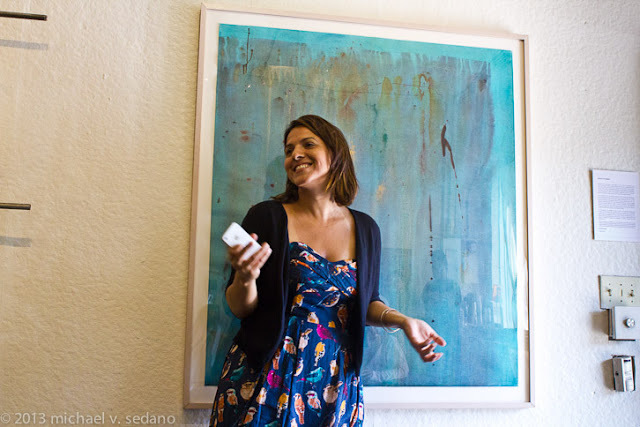 Recently, Ceballos has had her poems published in Hinchas de Poesia, Haight Ashbury Journal and RA. She also writes prose and has completed a novel manuscript. The novel is still looking for a home, but her first poetry collection will be out in 2014. And she has plans for a Bluebird Anthology. When she's not working, writing poetry, or producing poetry events, Jessica photographs landscape and nature. She records and sings music, and adds beauty to the world with her words. Find out more about Jessica Ceballos at http://www.jessicaceballos.com. Features Ryan Nance and Jessica Ceballos, plus Khadija Anderson, tango, and an open mic. Good post, Melinda. Jessica sounds very much like a Renaissance Woman who has returned home and is blazing trails! Good for her. I've calendared the Bluebird Series event this Sunday and will hopefully see you all there. Sounds very exciting! Best wishes. Thanks Melinda! I love all the work Jessica is doing in the literary arts para la gente. Adelante! Teaching the Chicana and Chicano "Body"